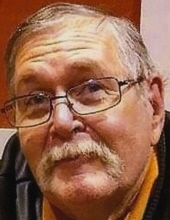 Steven Douglas Mathis, 69, of Grinnell, died on Sunday, February 3, 2019 at his home in Grinnell. A memorial service will be held at 2:00 p.m. on Friday February 8, 2019, at Smith Funeral Home in Grinnell. A private family graveside service at Westfield Cemetery in Grinnell will be held at a later date. Visitation will begin at 1:00 p.m. on Friday, February 8, 2019, at the Smith Funeral Home in Grinnell. Memorials may be designated to the Steven Mathis Memorial Fund, mailed in care of the Smith Funeral Home, PO Box 368, Grinnell, Iowa 50112. Steven was born on November 4, 1949 in Hamburg, Iowa, the son of Donald Mathis and Carrie (Barnard) Mathis. Steven was a 1968 graduate of Farragut High School in Farragut, Iowa. He later graduated from the Universal Trade School in Omaha, NE. He married Sharon Miller at the Methodist Church in Riverton, Iowa on January 11, 1970. Steven worked as a truck driver for over 30 years and later owned his own welding company. He loved to go camping, loved the Iowa Hawkeyes and Denver Broncos. Steven enjoyed sitting in his back yard feeding the birds and shooting the squirrels. He enjoyed watching Hallmark Christmas movies and was known to everyone as a hard worker. Steven was a volunteer with the Grinnell Fire Department for many years. He served with the Iowa National Guard for 6 years during the Vietnam War. The light of his life was his grandchildren and his great grandchildren, he would see them and just light up with a smile. Steven is survived by his wife, Sharon Mathis of Grinnell, his sons, Doug (Kelly) Mathis of Marion, Iowa, Jake (Amber) Mathis of Gilman, Iowa; his grandchildren, Tyler (Amber) Mathis, Lane Mathis, Haley Mathis, Wyatt Mathis, Isaiah Williams, Emma Mathis, Kayla Felix and Brandon Hall; 7 great grandchildren; his brother, Keith (Mary) Mathis of Wasilla, AK. He was preceded in death by his parents, Don and Carrie Mathis. To send flowers or a remembrance gift to the family of Steven Douglas Mathis, please visit our Tribute Store. "Email Address" would like to share the life celebration of Steven Douglas Mathis. Click on the "link" to go to share a favorite memory or leave a condolence message for the family.